Starting in 2002, Dan Goldgeier began writing a semi-regular column for the advertising site Talent Zoo, called “The View from the Cheap Seats”. Ten years later he has compiled more than half of those essays into a book of the same name. From Mr. Goldgeier’s perspective the book makes perfect sense. The essays are already written so why not expose them to a new audience who might have missed them the first time around? But why would that new audience be interested? Why would they – you, frankly – care about essays on advertising written in the heat of the moment five, seven, ten years ago? In advertising, last week feels like a century ago; three years is practically prehistoric. But the value of “Cheap Seats” – as a book and as a column – lies precisely in its immediacy. These are essays written from the front lines of the industry, by a real person addressing the real problems, crises, annoyances and hysterical pregnancies that agency people deal with on a daily basis. Paradoxically, that makes them curiously timeless. Change the names, change the agencies, change the media choices and the things Goldgeier is writing about and worrying over would be familiar to Bernbach or Lasker or Resor or any of the great names from the history of our industry. Blame-shifting creative directors (“Living Under the Bus”). Less than ethical clients (“My Client, the Bait-and-Switch Sleazebags”). The death of the industry itself (“Nothing is Dead, So Let’s Bury That Idea”). The simple challenge of making something new and compelling and exciting, on demand, over and over again (Um… pretty much all the essays). This is about what we do and about what we have always done. Mr. Goldgeier approaches these topics with a style that is friendly, accessible, and funny and yet not as superficial as those adjectives might imply. And he does it while delivering a cogent insight. This is no mean feat for someone delivering an essay on a regular basis. Ahem. At times he expresses outrage, but it is generally clever outrage – not the unharnessed berserker vitriol that characterizes our political discourse. And that may be because he usually attempts to see the question from the other side (even if the other side is mindless, sleazy and reeking of the banality of evil). Or perhaps its because the essays always have the hope that things could actually be made right – though they’re usually tinged with the despair that this may be beyond the abilities of one simple copywriter. That these two characteristics – an ability to see the whole board and a desperate optimism – are native to most great copywriters is probably not coincidental. There are, it must be noted, two themes that the ghosts of advertising past might have found curious for Mr. Goldgeier to return to again and again. The first is his championing and defense of retail marketing. Mr. Goldgeier makes no bones about the fact that he believes it is our job to help our clients sell things to their customers. And he is astute in his understanding of just how hard this is under the best of circumstances, and how nearly impossible it is when the creative director, the account team, and often the client themselves have lost sight of this simple goal. One wonders if even Bill Bernbach, who is largely credited with igniting the Creative Revolution and who inspired such scions of it as George Lois, Julian Koenig and Mary Wells Lawrence, would have had to be reminded of that. A question that speaks volumes about our era. The other theme is similar; specifically, his concern about how alienated the people who make advertising – both agencies and clients – are from the people they are trying to sell to. The sense that neither know how to sell (largely because they have never had to) and have no real tangible, how’s-your-mama-how’s-the-baby” understanding of the human beings they commonly refer to as “targets”, “consumers”, “customers”, “users” and “the demographic”. Maybe it’s always been thus. Or perhaps the very same technology that offers us so many ways to connect with each other has only succeeded in making us more insulated in our presumption. Call it the “Babel Fish Effect”. And this is why every agency head should read “The View from the Cheap Seats”. Because it says the things that the people in your cubicles – and in your clients’ cubicles – are thinking on and fretting about and worrying over. Or that they should be. 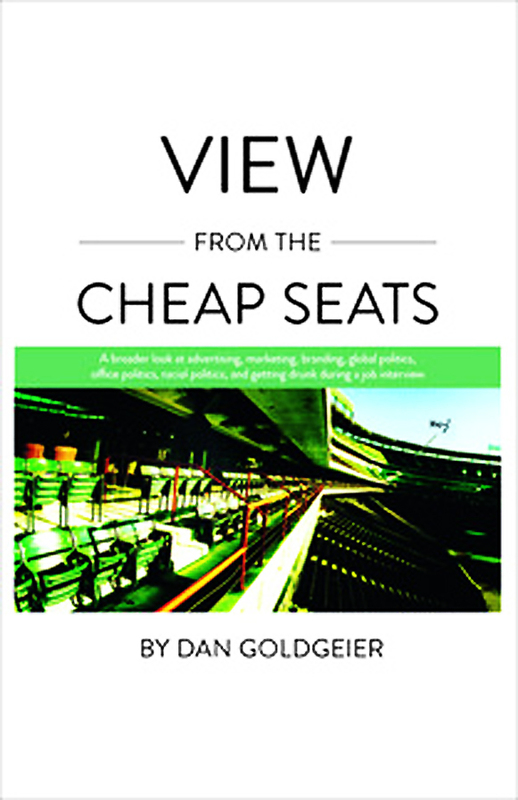 View from the Cheap Seats by Dan Goldgeier was published by CreateSpace on 11/09/11 – order it from Amazon here or from Barnes & Noble here – or pick it up at your local bookseller ( find one here).